have a longer service life. typical, low-end Chinese replacement batteries. You will also enjoy additional years of service too (typically, 300-500 recharge cycles).Texas Instrument chipsets provide the vital task of managing the state of charge and the communication with your laptop, extending your battery life. Work longer on the train. Get more Facebook time. Stay on the beach longer. And increase your laptop battery life with Xtend. Xtend brand computer batteries are guaranteed to meet, and often exceed, the original manufacturer’s specifications. They are backed with a full 1-year warranty from date of purchase. Each is brand new and tested before shipment to ensure that it passes stringent quality control standards. 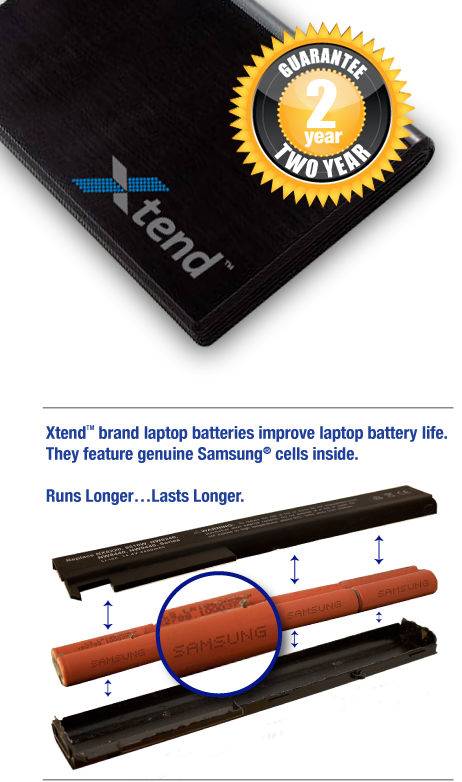 All Xtend replacement laptop batteries have passed the CE certification Approval Safety Standard.Be sure to ask for XtendTM brand replacement laptop batteries by name. Samsung ®and Texas Instruments® are registered trademarks and the property of their respective owners.